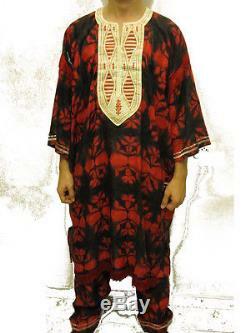 GENUINE AFRICAN CLOTHING 3PCS MEN DASHIKI CHURCH WEDDING SUIT RED/BLACK/GOLD. The item "GENUINE AFRICAN CLOTHING 3PCS MEN DASHIKI CHURCH WEDDING SUIT RED/BLACK/GOLD" is in sale since Saturday, January 23, 2016. This item is in the category "Clothing, Shoes & Accessories\World & Traditional Clothing\Africa". The seller is "grinch-il" and is located in Holy Land. This item can be shipped worldwide.